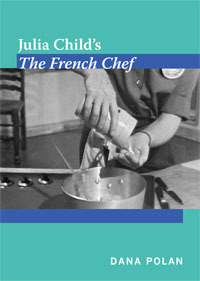 Last night, Professor Dana Polan celebrated the publication of his most recent book, Julia Child’s The French Chef, with a soiree at the Humanities Initiative. Polan was granted a Faculty Research Fellowship last year, and the end of his tenure as a fellow is well marked by the release of this highly anticipated book. Colleagues, family, and friends sipped French wines and partook of handmade French pastries as clips from the Julia Child’s television show flickered on the wall. A lovely evening indeed. We congratulate Professor Polan on his new publication!